So you've got your Tarot deck, you've figured out how to keep it safe from negativity, and now you're ready to read for someone else. Perhaps it's a friend who's heard about your interest in Tarot. Maybe it's a coven sister in need of guidance. Perhaps -- and this happens a lot -- it's a friend of a friend, who has a problem and would like to see "what the future holds." Regardless, there are a few things you should do before you take on the responsibility of reading cards for another person. 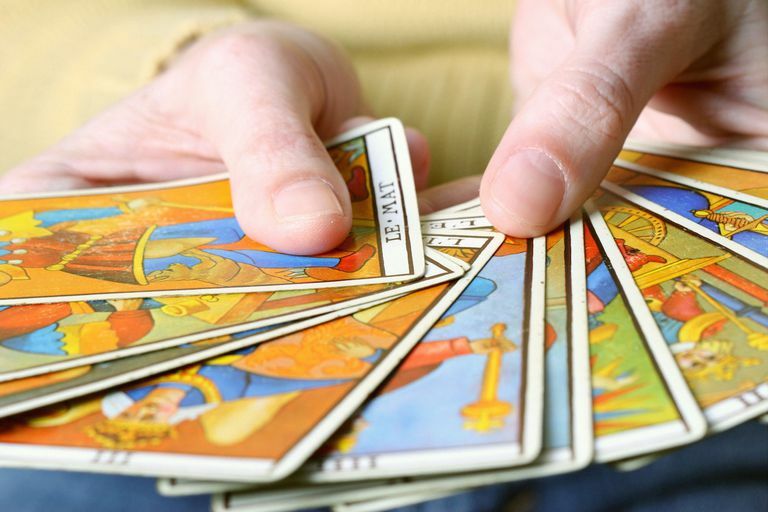 First, before you read for someone else, make sure you've brushed up on the basics of Tarot. It's important that you study and learn the meanings of the 78 cards in the deck. Study the major arcana, as well as the four suits, so that you know what each card represents. Readers who are more intuitive may get slightly different meanings than the traditional "book taught" representations, and that's okay. The point is, know what you're doing before you do it for someone else. Meanings that are only partially learned will result in only a partial reading. Decide whether you feel comfortable using "reversals" in your divination. Many people read a card the same way no matter how it turns up. Others follow the reversed meanings that are applied to each card. It's up to you whether you use reversed meanings or not, but it's a good idea to be consistent. In other words, if you use reversals, use them every time they appear, not just when it's convenient. Remember, as the cards are shuffled they will become very well mixed. In some traditions of Tarot, the reader will select a card to represent the Querent -- the person for whom you are reading. This is sometimes referred to as a Significator card. In some traditions, the Significator is selected based on age and maturity level -- a King would be a good choice for an older man, while a Page or Knight would do for a younger, less experienced male. Some readers select a card based on personality -- your earth-mother best friend may be perfectly represented by the Empress or your really devout uncle by the Hierophant. If you don't want to assign a card to the Querent, you don't have to. It's a good idea to have the Querent shuffle the deck so the cards can pick up on his or her energies. If you feel the Querent has some negativity attached to him, cleanse the deck after the reading. If you really don't want the Querent to shuffle, at the very least you should allow him or her to cut the deck into three piles once you've completed the shuffling. As he does so, the Querent should silently ask a simple but important question on which the reading will focus. Ask the Querent not to share this question with you until you've completed the reading. Decide which layout you want to use -- some people prefer the Celtic Cross, others the Romany method, or you can make up your own. Start at the top of the deck, and place the cards in the order dictated by your spread. As you turn the cards over to be read, flip them from one side to the other, rather than vertically -- if you turn them vertically, a reversed card will end up right-side up and vice versa. Place all the cards in the layout in front of you at once, before you begin reading any of them. Once all the cards are laid out, set the rest of the deck aside. Give a quick glance over the spread, and look for any patterns. For example, is there more of one suit than others? Are there a lot of court cards, or an absence of the Major Arcana? Note the suits as well, because this will give you an idea of the possible direction of the reading. Now that you've looked them over, it's time to get down to the nitty-gritty, and do your reading! Are you ready to learn more about the Tarot? Use our 6-step Intro to Tarot Study Guide to get yourself started!